A lot of times, I will say... "Honey, I've got an idea." My Sweetie, will look at me, never really knowing what I will say next. It can be as simple as a quick change of furniture placement... or it can be as big as the future plans of the homestead. Like I said, it's an idea, not necessarily one that I get to do right away. Well, I had an idea and it was one that Shannon was on board with too. We just had to gather materials. We found some barrels that held some sugar water. You want some that either have never been used, or contained something that you can clean out. If they held oil, gas, something hazardous... of course you don't want those. We wanted a barrel that had a screw off top, but we couldn't find one in our price range... which was $0... so we took what we could get and sawed the top off. After taking the top off we gave it a thorough cleaning on the inside. Then we took some fine screen and cut it in the diameter of the top of barrel. The reason for the screen is to keep debris from getting in the water as well as helping deter a mosquito infestation. Stapled in nice and tight. Eli handled the caulk gun. The tap was put on the side, we drilled a hole the same size as the spigot and screwed it in. We then rigged up some old flexible tubing that we found and ran it from the side of the hen house and down to the top of the barrel like a homemade gutter. It may not be perfect, but it helps to direct the rain a little more towards the barrel and with the barrel having such a wide mouth, we can catch even more rain. 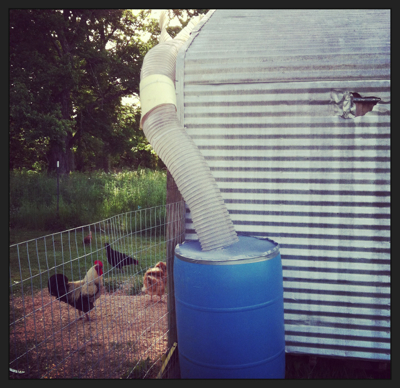 Now, we can easily fit a short water hose to the spout and when we have collected enough water, our chickens will be able to be watered from our collection. Thus saving us some money and not having to feed our birds fluoridated water. If you have something similar set up, let me know! I'd love any pointers! how did you get the water out? What a cool idea! And the raised beds in the background look great! I'm gonna have some one of these days! May I borrow your "honey" and kids??? Great project! !